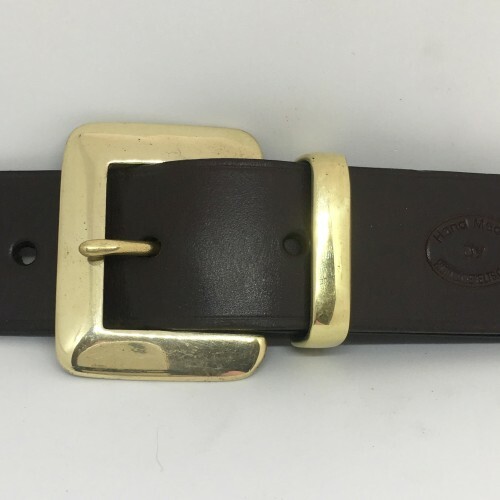 A strong and sturdy belt with solid brass buckle and keeper. Great with jeans and casual wear. Available 1.5” width. So we can make exactly the right size belt for you we suggest that while wearing your jeans/trousers you measure through the loops. We will make this measurement the middle hole of five holes on your new belt. Your belt will be measured from the inside of the buckle bar to this middle hole. If you normally buy say size 34" trousers, your belt measurement will usually be approximately 2" larger than this as the belt has to pass over the material of your trousers. If you would like a colour not shown on the right, other colours are available on request. Also note that computer screens can portray our colours in various shades and, if you are in doubt about the colour you require, please email us and request a colour swatch prior to order. This belt is made specifically for you. In order to personalise the belt we emboss up to 3 initials discretely inside. Please ensure you tell us which characters to use when ordering. We can also provide up to 10 characters of External Embossed Lettering for a charge as shown when ordering. Silver lettering is also available on request, so please email me for a quotation. 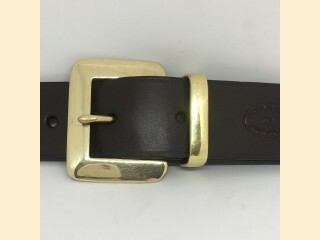 Belt Width --- Please Select --- 1.5"